Last year Sleek Makeup celebrated their tenth birthday and released their Diamond Decade i-Divine Eyeshadow Palette with a mix of silvers, blacks and pinks. They say that the pink is their signature but, for me, when I think of the old Sleek palettes back when I first started buying them the matte black is the thing that stood out for me as being above the competition. It wasn’t always the best but I have a couple of the early palettes where the black is better than any others I’ve tried so I was happy to see a matte black included. You can find it on the Boots and Sleek websites for £8.99. There are twelve eyeshadows in this and there’s a mix of finishes with two that I would call true matte, one that’s almost matte but has a duochrome hint to it and eight that are shimmers of various descriptions (though one is a matte base with glitter in really). The palette sort of has three sections of colour with four pinks, four silvers and four blacks, though one of the silvers is more gunmetal. It’s definitely an unusual mix of colours to me and not one I’d really go for normally. The second in the week of Sleek Makeup reviews is the Colour Corrector Palette. This is a small palette containing six different colours of cream formula colour correctors, each is 0.4g. These include green, lilac, blue, rose, yellow and orange which are each aimed at a different skin pigmentation problem. It costs £7.99 on the Boots and Superdrug websites, though I can’t find it on the Sleek Makeup website so I think it may not be available for much longer. I haven’t really tried proper colour correctors, at least not the range of colours in this, so it was interesting to see how these worked for me. I would say that I have dark circles and red patches on my skin so the green and yellow are most definitely ones I’d be trying, but seeing all the videos and pictures of colour correction were interesting to try. Last year, I think when they were first released, I bought three Sleek Makeup Matte Me Metallic liquid lipsticks in a set with the Distorted Dreams highlight in Boots on offer. Then I put them somewhere safe to review, so safe I couldn’t find them, until a couple of weeks ago when they resurfaced and I’ve been playing around with them. It’s a bit of a late review but the whole matte and metallic combination intrigued me and I hadn’t tried any before. Since I got these the range has expanded but the three I have are still available, they’re Roman Copper, Volcanic and Rusted Rose. Matte Me Metallics cost £4.99 each for a 6ml tube and are part of the Matte Me range of liquid lipsticks. These three are available from Boots, Superdrug or the Sleek Makeup website at the same price. A recent look through my makeup after I had emptied everything out to redecorate my room showed me that I still had some of the things I’d bought years ago and have been sat in my drawers doing nothing. They’re the products that come out every declutter and I keep because they’re too nice to throw away and I don’t actually have anything like it but it’s useful, if that makes sense, so I thought I’d give this Blush by 3 Blush Palette from Sleek Makeup in Pink Lemonade a proper try and see whether it was as good as I thought. I think the price may have increased since I bought it but it’s three blush palettes, two powder and one cream, in shades of pink. It costs £9.99 and is available from Superdrug, Boots and their own website. As I have pale skin it’s sometimes hard to find brushes that look good so when this first came out I wanted to give it a go as they seemed light enough and I have always been a fan of Sleek. 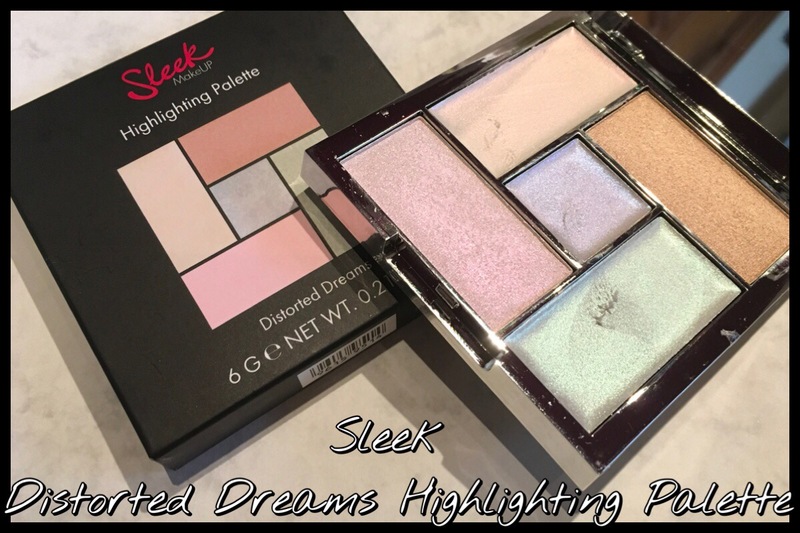 Considering I don’t really do highlighting I seem to have jumped in the deep end with my first proper highlighting products, if you don’t count ones in face palettes, with the Tony Moly rainbow one and now this Sleek Distorted Dreams Highlighting Palette. I think it’s one of the most colourful, least subtle highlighter palettes I’ve found and I kind of love that about it. I did only really get this palette as it’s part of an offer in Boots where you get this and the three matte metallic lip colours for £15 (you can find the set here online) and each of the lip colours costs £4.99 so this was essentially 3p so it seemed too good an offer to pass up. Plus look at the colours, they’re just so pretty! On its own this palette costs £10.99 and contains five highlighters; three creams and two powders, with five different colours. I’d say two were duochrome type highlighters, two are more shimmer and one is a mix of both with added glitter in the mix so these aren’t you’re everyday highlighting products, or not for me anyway. It does say on the box that they’re multipurpose so I’ve given them a bit of a go for other uses too which was fun to play around with. I bought the Sleek Force of Nature eyeshadow palette a while ago, though it seems like it was released late last year and I somehow managed to miss it at the time. It does say it’s limited edition but I have found it still on the Superdrug website, here, so if you like the look of it I’d get it as soon as possible as you never know when they’ll disappear with it being Limited Edition and not exactly recently released. Sleek i-Divine palettes are mineral eyeshadow palettes and have 12 eyeshadows in them, each is 1.1g (0.03 oz.) and they do a large range of colours and finishes. This Force of Nature palette has all twelve as mattes and in autumnal colours with quite a few neutrals, purples and a dark green and blue. As a brand Sleek are cruelty free but I’m not sure if this one is suitable for vegans so if you only buy vegan products I’d look at the ingredients (I’ve photographed it and it’s below the cut if you want to check). This palette costs £8.99 which makes it one of their more expensive palettes, I’m not sure why some are £7.99 and others this price but it’s still a good price for twelve eyeshadows. Sleek recently released a Limited Edition Whimsical Wonderland Collection which had an eyeshadow palette, three Lip VIP lipsticks and three gel blushes. I have done reviews of the lipsticks and the eyeshadow palette so today it’s the turn of the last of the products; the Sweet Cheeks gel blush. I think that this is a new product type, I can’t see any other blush sticks on the Sleek website. These cost £5.49 on the Superdrug site (currently in a two for £10) or £5.50 on the Sleek website and come in three different colours; Tomfoolery (purple/dark pink), Hullaballoo (pink) and Lickety Split (coral) so there’s a range of colours available. I chose the colour Tomfoolery as I didn’t know what the formula would be like. They are meant to be fairly sheer, although they do look rather dramatic in the twist up container they do become sheer and blend out really well. Sleek recently released a collection for summer called the Whimsical Wonderland collection which is limited edition. I think it was released at the beginning of June some time here in the UK and includes an eyeshadow palette, three Lip VIP semi-matte lipsticks and three gel blushes. I got the three Lip VIPs (find my post here), the palette and one of the gel blushes (that post is here) and this post is a review of the palette, the others will be up next week if you want to check back and read them. The palette itself is called All the Fun of the Fair and is a mix of matte and shimmers in pastel colours which gives a great range of light, summery shades to choose from. This twelve shade mineral eyeshadow palette is split fifty fifty with six mattes and six shimmers. It costs £8.99 and, at the moment, is in an offer of two for £10 on the Superdrug website. At the moment I can only find it on the Superdrug site or the Sleek Makeup website though I think it will probably be available in Boots as I can’t see anything calling it exclusive to those two.